No wonder most of the beautiful and highly recognized hotels around the globe are named Park! 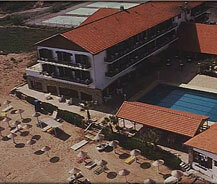 The Park Hotel, situated in the port of Famagusta near to Salamis Region, is no exception to this. Within the radius of around 5 kilometers from the port and colorful town of Famagusta is where the Park Hotel situated and that adds to the beauty of this part of salamis region which boasts of historic ruins. Park is a 3 star hotel and the features that distinguish this hotel from the others are "The Park has its own casino and a private beach which gives beautiful view of the sea". The hotel comprises of around 93 rooms furnished with all the necessary amenities such as shower, international telephone lines, Ac, and television. The hotel has a mini-bar attached. The hotel which is air conditioned in the summer is heated centrally during the winter season which makes this hotel preferable in all the seasons. Therefore comfort is guaranteed with high standards all round the year. Other facilities that are available in the hotel premises includes a swimming pool, wind surfing, beach bar and tennis courts etc. Apart from the beauty of the hotel that overlooks the beach, another feature of the hotel for which it is noted for its excellence is the manner of preparing various dishes.